While out surfing on a secluded beach, Nancy (Blake Lively) strays into the feeding ground of a great white shark. Stranded only 200 yards from the shore, Nancy is pushed to the limit in a brutal fight for survival. It is a brave filmmaker who dares to enter the waters alongside one of cinema’s greatest aquatic monsters. However, while The Shallows doesn’t even begin to rival Jaws, it is a tense and entertaining thrill ride. 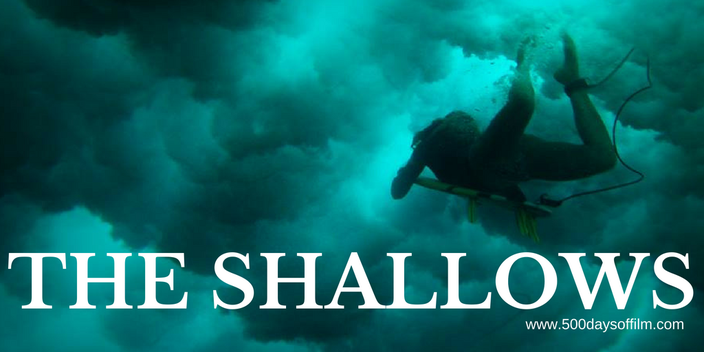 The Shallows is a 96 minute, popcorn-fueled B movie. If you are willing to suspend your disbelief and just go with it, you will find much to enjoy. Apart from the small matter of a great white shark, The Shallows actually bears very little resemblance to Jaws. Director Jaume Collet-Serra’s movie has more in common with Danny Boyle’s real life survival film, 127 Hours. Like Aron Ralston, Nancy is stranded with little hope of rescue. Like Ralston, she has to make some tough decisions. And, just like Ralston, Nancy has to perform some self-surgery - earrings have never been so useful. For the majority of the film, it is just Nancy versus the shark. Blake Lively’s physical and emotional performance is impressive - despite her rather clunky bolt-on backstory. Still, we care about her and feel extremely uncomfortable every time she enters those dangerous waters. On the set of Jaws, Spielberg's shark (nicknamed Bruce) was notoriously challenging. Technical difficulties meant that very little of the shark is actually seen during the entire movie. Of course, this worked to the film’s advantage. Jaws is far scarier because we can’t see Bruce and our imagination is left to fill in the gaps. The Shallows uses this same trick by keeping its shark in the shadows. Up until the end of the movie, we see it only in brief (jump scare) moments. However, as with many horror movies, as soon as we meet the underwater monster, it no longer feels quite so frightening. All the same, I think I’ll leave it a while before I go swimming in the sea again. Have you seen The Shallows? If you have, what did you think of this movie? Did you enjoy it? Or did it let you down? What’s your favourite cinematic tale of survival? Do let me know - leave me a comment in the box below!